Safavieh Lighting 25-inch Tory Sea Shell Table Lamp (Set of 2) - 15" x 8" x 24.5"
Safavieh Lighting 27.75-inch Joyce Faux Alligator Grey Table Lamp (Set of 2) - 18" x 8 " x 27.75"
Add a touch of vintage with the addition of this classy, 20-inch high, mirrored table lamp. It has a 12-inch wide, cotton drum lamp shade that delivers ambient lighting. The base is made of aluminum and glass. Keeping in tune with its modern design, it has a clear lamp cord with an inline switch. To be used with a maximum 60-watt lightbulb. Light bulb not included. I was disappointed when this lamp arrived. Where the light mechanism meets the glass bottom is a thin metal plate which is too weak to hold the weight of the light and shade properly so it looks like the shade is always leaning and there is no way that I can see to fix it unless my husband fabricates and welds on a new plate. The cord comes out just above that thin plate which is not ideal and obvious in the pictures. Otherwise it was pretty, but I wish I had picked something different considering the price. These were nice but too small for what I needed definitely not for end tables maybe these are more for decorative purposes. I ended up exchanging them. "Is the base of this lamp 20 inches? How tall is the lamp with the shade?" 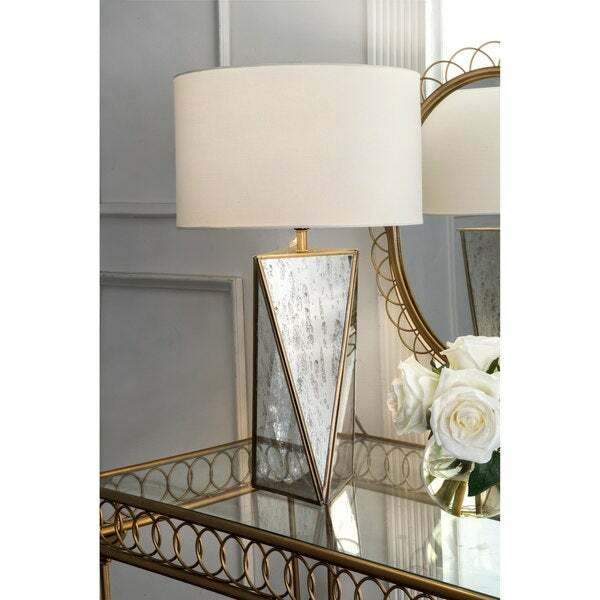 The measurements of this lamp are 20’’ Height x 12’’ Width x 12’’ Depth with the shade. The dimensions of the lamp with the shade are 20 inches H x 12 inches W x 12 inches D.
Safavieh Lighting 27.75-inch Joyce Faux Alligator Cream Table Lamp (Set of 2) - 18" x 8 " x 27.75"